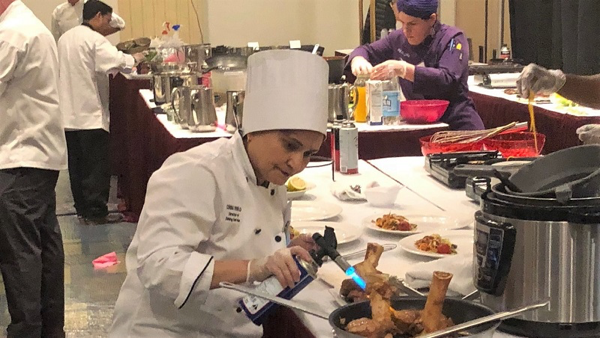 One of the judges told Chef Corina Rebello that there’s “no way” to properly cook a veal shank in under an hour, the allotted time for competitors in the Connecticut Assisted Living Association’s (CALA) 2018 Chef Challenge. Not only that, Chef Rebello was attempting a complicated dish involving careful butchering and classical French techniques. Chef Corina Rebello squeezes fresh lemon juice into gremolata, a classic garnish for osso buco. Corina uses a culinary torch to brown the marrow bone of the veal shank. The panel of professional chefs judged dishes on elements such as creativity, taste, presentation and nutritional balance, and awarded first, second and third place to the best beef, chicken and seafood dishes. “You proved me wrong,” said the judge after Chef Rebello took first place in the beef category. Learn about Benchmark’s clean sweep in last year’s Chef Challenge.